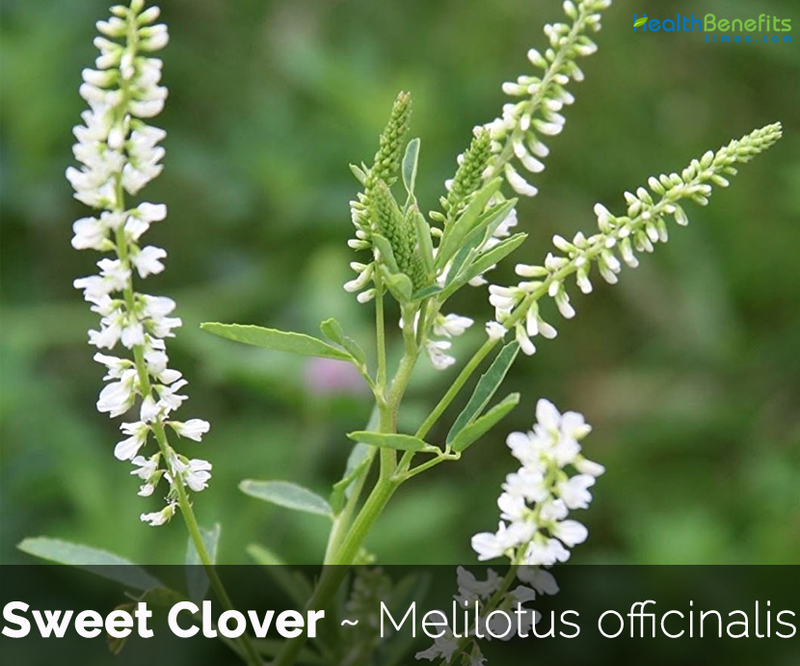 Sweet Clover scientifically known as Melilotus officinalis is an erect, annual, freely branched plant of the legume, or Leguminosae, family. The plant is native to North Africa, Europe as well as the temperate climatic regions of Asia and over the years the herb has been naturalized in North America. Popular and local English names are Casse Lunettes, Common Melilot, Couronne Royale, Field Melilot, Hart’s Tree, Hay Flower, Herbe aux Puces, King’s Clover, Luzerne Bâtarde, Melilot, Mélilot des Champs, Mélilot Commun, Mélilot Jaune, Mélilot Officinal, Mélilot Vulgaire, Meliloti Herba, Meliloto, Melilotus, Petit-Trèfle Jaune, Pratelle, Sweet Lucerne, Sweet Melilot, Tall Melilot, Thé de Jardin, Trébol de Olor, Trèfle des Mouches, Wild Laburnum, Yellow Melilot and Yellow Sweet Clover. 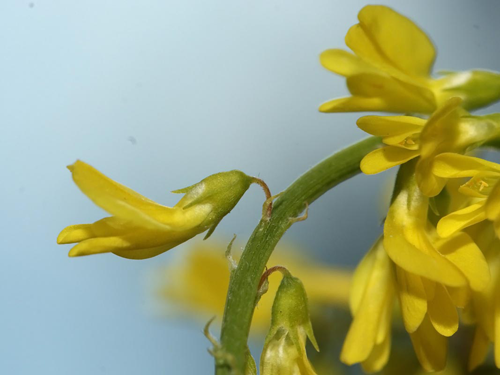 The genus name Melilotus comes from the Greek ‘meli’ (honey) and ‘lotos’ (clover in the broad sense). The epithet officinalis suggests that it is an old medicinal plant, because the “officina” is the sales room of a pharmacy and ‘officinalis’ means used in the pharmacies. In the early 1900s, sweet clover was grown for forage and to build up the soil, since its roots help to keep nitrogen in the soil. In the twenty-first century it is used to support honey production. 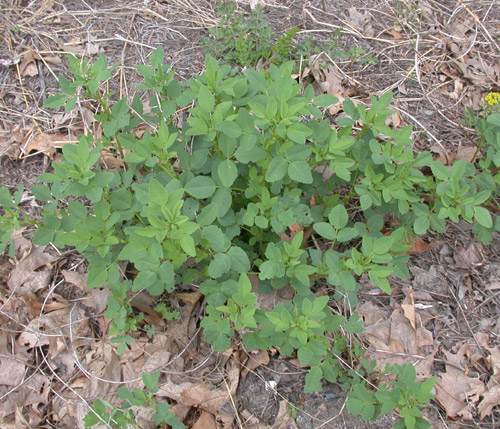 In some agricultural areas of the United States, however, sweet clover is now considered a nuisance because it spreads rapidly and can take over open fields or prairies. Sweet Clover is an erect, annual, biennial or short-lived perennial herb, sparsely puberulent to glabrescent freely branched plant that grows about 10 feet (3 m) tall. The plant is found growing as a weed in grasslands, disturbed sites, prairies, savannas, dunes, hillsides, ravine shores, roadsides, forest edges, railways, fields, waterways, abandoned fields, roadsides, railroad ballasts. It grows on a variety of alkaline or slightly acidic soils. Very low nutrient levels and fine- and coarse-textured soils are tolerated. Several reviews specify that yellow sweet clover endures nutrient-poor and dry soils better than white sweet clover. The plant has taproot that can extend as deep as 3–5 ft. (0.9–1.5 m) into the subsoil, with secondary fibrous roots and bacterial nodules. Taproots are semi woody, and lateral roots can be extensive. Lateral roots may extend 6 to 8 inches (15-20 cm) from the taproot. The stems are usually more or less erect, 100(-250) cm long, although sometimes they sprawl across the ground. They are glabrous, furrowed, and angular; sometimes the lower stems are ribbed light red. During its first year of growth, most of its energy goes into developing its root system. In the second year it flowers between May and September, sets its seeds, and dies. Its seeds may remain viable for over 30 years. Alternate compound leaves are trifoliate and hairless. 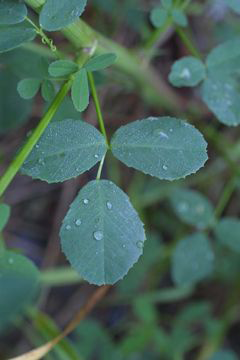 The leaves have three leaflets, and are alternate along the stem. Each leaflet is about ¾ inches long and ¼ inches across. It is oblong, oblanceolate, or obovate in shape, and dentate along the middle or upper margin. The terminal leaflet has a short petiolule (stalk at its base), while the lateral leaflets are nearly sessile. The petiole of each compound leaf is about ½ inches long. There is a pair of small linear stipules at its base. The flowers occur in raceme which is up to 6 inches long and has dozens of flowers. Flowers are loosely arranged along the raceme and somewhat drooping. They may occur along one or two sides of the raceme, or in whorls. Each flower is about 1/3 inches long and has a tendency to droop downward from the raceme, although curving upward toward its tip. The corolla has 5 yellow petals and is rather slender, consisting of a standard, keel, and two side petals. 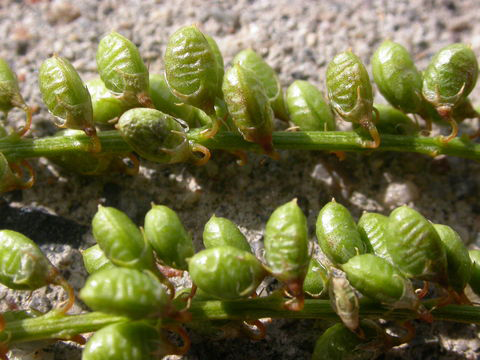 The tubular calyx is light green and has 5 pointed teeth. The flower is tubular and becomes broader toward the outer edges of the petals. Flowering normally takes place from July to September. Each flower is replaced by a small seedpod with a beak that is flattened and contains 1-2 seeds. There are usually transverse ridges on each side that are somewhat curved. They are usually green when young and turn to dark brown as they mature. 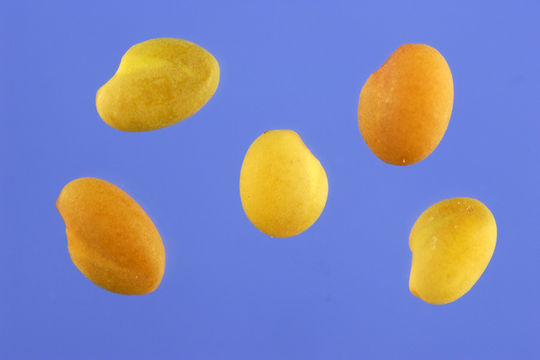 The tannish yellow seeds are somewhat flattened and ovoid-reniform in shape. Sweet Clover spreads by reseeding itself, and it often forms colonies at favorable sites. Sweet Clover is used to increase the urine output in humans. Even though there are no clinical proofs to support the claim, the herb is supposed to be a potent diuretic in folk medicine. Sweet Clover is widely used to treat venous issues such as – varicose veins, blood clots in the veins, hemorrhoids, thrombophlebitis and lymphatic congestions. The herb helps in reducing the symptoms of poor blood circulation, a condition which is popularly referred as chronic venous insufficiency. Sweet Clover helps in relieving leg pain and cramps, and also solves the problems of inflammatory and congestive edema. The herb is accepted by the German Commission E for treating hemorrhoids and venous conditions. The herb forms an important part of many herbal ointments that are used to treat wounds and blunt injuries. In fact, Sweet Clover is also accepted by the German Commission E for treating injuries and wounds. Sweet Clover is also used to treat minor sleep related issues and also to treat contusions, elephantiasis, sprains and digestive problems. 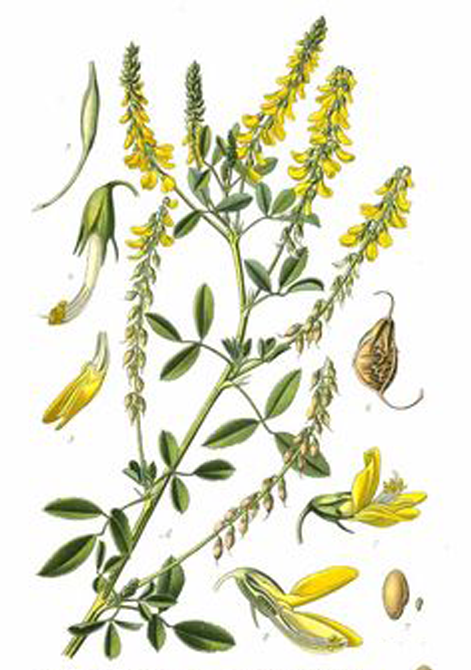 Sweet clover produces a coumarin compound that can be converted to dicoumarin, which is used medicinally as an anticoagulant. Sweet clover has also been used medicinally to treat external and internal inflammation and stomach and intestinal ulcers. Sweet clover inflorescences have been used in eye lotions. Sweet Clover is used either externally or internally, can help treat varicose veins and hemorrhoids though it requires a long-term treatment for the effect to be realized. Use of the plant also helps to reduce the risk of phlebitis and thrombosis. Flowering plant is antispasmodic, aromatic, carminative, diuretic, emollient, mildly expectorant, mildly sedative and vulnerary. An infusion is used in the treatment of sleeplessness, nervous tension, neuralgia, palpitations, varicose veins, painful congestive menstruation, in the prevention of thrombosis, flatulence and intestinal disorders. Externally, it is used to treat eye inflammations, rheumatic pains, swollen joints, severe bruising, boils and erysipelas, whilst a decoction is added to the bath-water. Distilled water obtained from the flowering tops is an effective treatment for conjunctivitis. Applied as a plaster, or in ointment, or as a fomentation, it is an old-fashioned country remedy for the relief of abdominal and rheumatic pains. In modern herbal practice it is taken internally for flatulence. Sweet Clover increases the blood flow through the veins to the heart. It is used to treat swollen veins of the legs. It helps to alleviate varicose veins, blood clots, phlebitis and thrombotic conditions. It relieves congestion of the Lymph glands and painful Menstruation. Sweet Clover is very effective in case of Flatulence. It relieves Colic, Indigestion and Stomach problems. It promotes the flow of Urine. It relieves excess Fluid Retention. It relieves Sleeplessness, Spasms, Anxiety, Earaches, Neuralgia and the pain of Tension Headaches. It is beneficial in treating Inflammation and Wounds. It eases painful swollen joints. It is useful for treating Boils and Skin problems. Sweet clover also facilitates in diminishing the hazards of developing thrombosis and phlebitis. Sweet clover has been used to cure indigestion and excessive stomach gas, problems related to menopause, bronchitis and rheumatic fever. 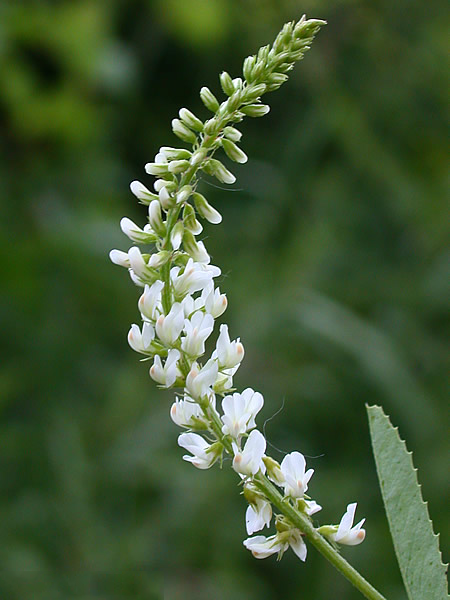 Northeastern “woodland” natives used dried white sweet clover leaves and flowers in teas. Flowers and seeds can be used as flavoring. Root is consumed as a food by the Kalmuks. Young shoots are cooked and used like asparagus. Young leaves are eaten in salads. Leaves and seedpods are cooked as a vegetable. Crushed dried leaves can be used as a vanilla flavoring in puddings, pastries etc. Flowers and seeds are used as a flavoring. Flowers also give an aromatic quality to some tisanes. Seeds can be used as a spice. 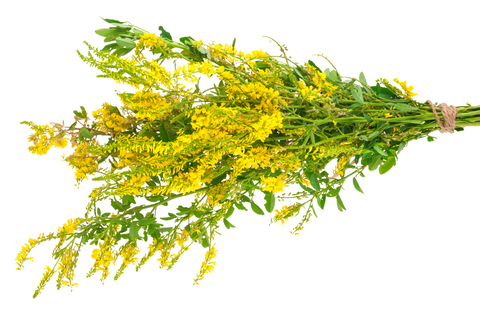 To prepare a sweet clover infusion, boiling water is poured over 1-2 tsp of the crushed flowers and stems. The infusion is allowed to steep for 5-10 minutes, and then strained into a cup. For the treatment of varicose veins, 2-3 cups per day is recommended. To prepare as a poultice, the crushed herb is mixed with a small amount of boiling water, then spread on a soft cloth. The cloth is applied to the affected area until the cloth is cold. The poultice is applied as needed. Sweet clover leaves were also used to scent linens and sleeping quarters by early settlers and members of Omaha and Dakota tribes. Sweet clover produces strong and deep penetrating taproots that can loosen and aerate compacted soils. Sweet clover is a major source of nectar for domestic honey bees. Leaves contain coumarin and they release the pleasant smell of newly mown hay when they are drying. Leaves are dried and used as an insect repellent, especially in order to repel moths from clothing. Leaves can be put in pillows, mattresses etc. 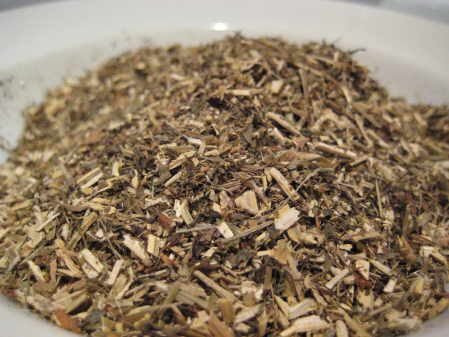 Poorly dried or fermented leaves produce a substance called dicoumarol. Dicoumarol is used in rat poisons. 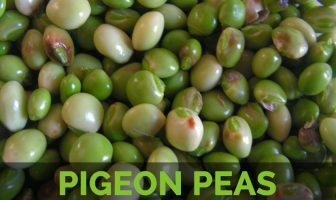 Plant can be used as a green manure, enriching the soil with nitrogen as well as providing organic matter. 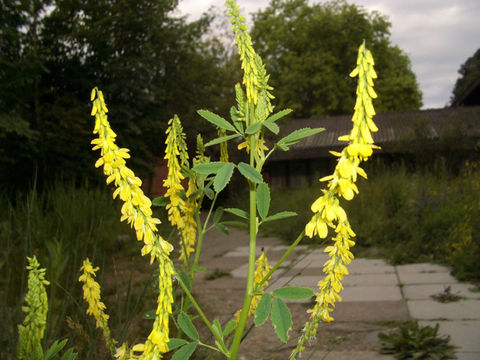 Melilotus officinalis has been planted as a forage and nitrogen-fixing crop, as a green manure for soil improvement. It is also used for hay, silage or pasture. Water distilled from the flowers was said to improve the flavor of other ingredients. 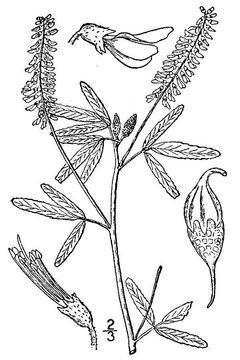 When packed with furs, Sweet Clover is said to act like camphor and preserve them from moths, besides imparting a pleasant fragrance. Sweet clover may also be used as a fodder for animals and also in the form of a green manure. One plant can produce from 14,000 to 350,000 seeds. Flowers are also used as a tobacco fragrance. Dried leaves can be toxic, though the fresh leaves are quite safe to use. Pregnant and nursing women should not use this. 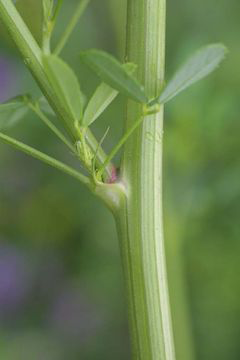 People with blood clotting problems should avoid this herb. High doses may cause liver problems. Discontinue sweet clover at least 2 weeks before elective surgical procedures. When partially dried leaves are taken in large amounts, it may result in the death of the person by bleeding profusely from his/ her wounds. 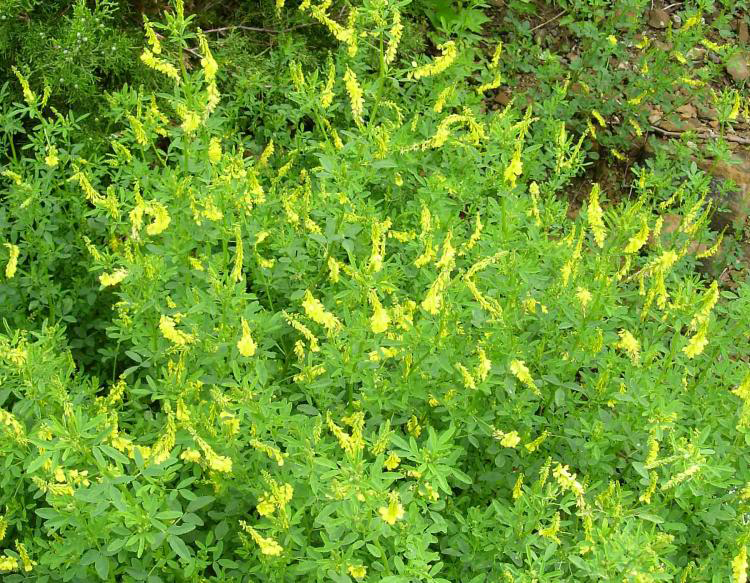 Several side effects of sweet clover are yellowed skin or eyes, bleeding or bruising, headaches, mood changes, stomach aches and dark urine. People enduring diabetes should also exercise caution while using this herb. Stem Stems are usually more or less erect, 100(-250) cm long, although sometimes they sprawl across the ground. They are glabrous, furrowed, and angular; sometimes the lower stems are ribbed light red. Leaf Alternate compound leaves are trifoliate and hairless. Each leaflet is about ¾” long and ¼” across; it is oblong, oblanceolate, or obovate in shape, and dentate along the middle or upper margin. 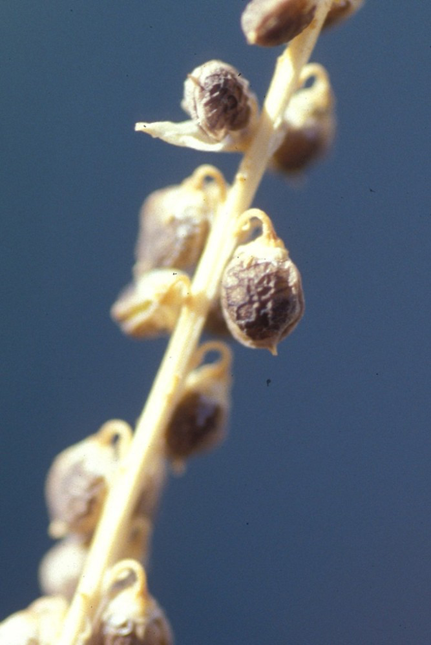 The terminal leaflet has a short petiolule (stalk at its base), while the lateral leaflets are nearly sessile.